The photographs that built a library will be on display when Critical Exposure hosts their 7th Annual Student Exhibit. In short, they don’t just teach high school students to take photos but how to use those pictures to change their own world. For instance, at Washington Metropolitan High School in Washington, DC, Critical Exposure began with a question to the students. The answer? We want a library. WMHS had no library, just an empty room with a small box of books. D.C. Met students documented conditions and created a presentation to make their case. It must have been persuasive. The students asked for $2,000, but their school superintendent gave them $20,000. In February 2012, more than one year after they began their project, Critical Exposure students celebrated their victory. Their school now has a fully-equipped library, complete with relevant books, sturdy shelves, new computer, comfortable chairs for relaxing, and elegant glass tables for group work. 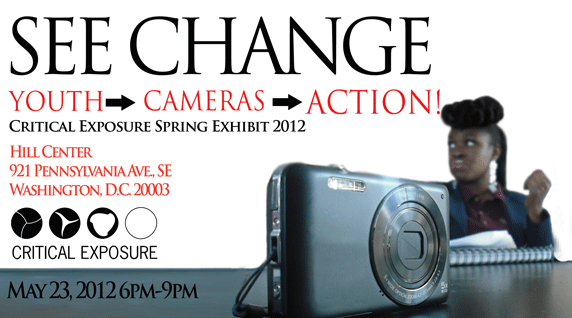 The 7th annual student photo exhibit, "SEE CHANGE: Youth -> Cameras -> Action!" will highlight the best student work of the year. Join them for the exhibit as well as a reception on May 23rd that will include drinks, appetizers, speakers, and more. Better yet, meet the students who use their photography to make change. You can register with a minimum $35 donation, but there are many other opportunities to give more. Learn more about Critical Exposure and the 7th Annual Gallery Exhibit in my interview with Adam Levner, Critical Exposure executive director.